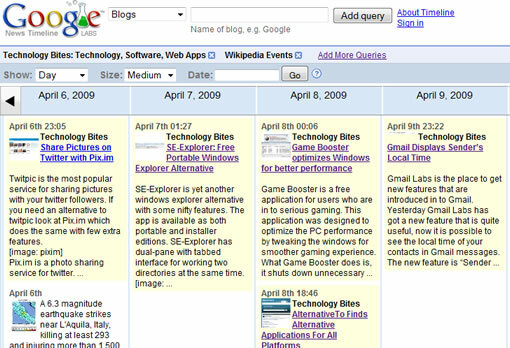 Another feature released today over Google Labs along with Similar Images is the Google News Timeline that lets you visualize news, blogs etc in chronological order on a timeline. The results are fetched from Google News, Blog search, wikipedia entries. The list of categories you can select includes a long list from News, Blogs, Movies, Music to Art Works. Select a category first and then search for what you wanted. If you can’t find the source you are looking for click “add more queries” button and then search for sources and add them. You can add Newspapers, Magazines, Blogs, sports scores, and other data like wikipedia events. You can drag the timeline or select the dates to visit particular date archives on the timeline.